Video – Jackson Pollock (USA, 1912-1956) painting outside his house in 1950. “Technique is just a means of arriving at a statement” [from YouTube]. 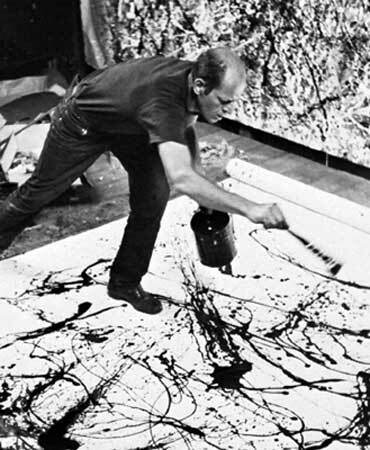 Pollock was probably the first and still unique man on planet earth able to continuously increase his fractal dimension signature along his life work. He call it “Action Painting“. In a way, canvas was an habitat for him. in Vitorino Ramos, On the Implicit and on the Artificial – Morphogenesis and Emergent Aesthetics in Autonomous Collective Systems, ARCHITOPIA Book, Art, Architecture and Science, INSTITUT D’ART CONTEMPORAIN, J.L. Maubant et al. (Eds. ), pp. 25-57, Chapter 2, ISBN 2905985631 – EAN 9782905985637, France, Feb. 2002.